Owners Stan Voelker and Ralph Reinhardt met while working for the Army National Guard. Both men desired the challenge of owning their own business, and a part-time business was formed. As Stan and Ralph’s reputation grew, Voelker Construction also expanded; becoming a full-time business and entering the market as a general contracting firm on July 1, 1978, at its current location: 14401 FM 973, Manor, Texas . The company soon entered the custom home market: Voelker Custom Homes. Stan, Ralph and their skilled team of craftsmen have successfully provided quality building services to Central Texas families for over 30 years. What services does Voelker Custom Homes provide? Voelker Custom Homes is a licensed, insured, full-service NAHB certified custom home building and remodeling company. Owner Stan Voelker has received four certifications from the National Association of Home Builders: Graduate Master Builder, Certified Graduate Builder, Certified Green Professional and Certified Aging-In-Place Specialist. In the Design Center within the Voelker Custom Home offices, Stan and Ralph walk each family through the building process step by step. Clients will receive a list of references and are encouraged to contact our providers, customers, and friends. What communities does Voelker Custom Homes serve? Voelker Custom Homes serves the entire Central Texas community. Voelker Custom Homes homes can be found as far east as Giddings, as far west as Hamilton, as far south as Seguin, as far north as Georgetown and numerous points in between. How is Voelker Custom Homes positioned in the Central Texas community? Voelker Custom Homes is a member of the Greater Austin Home Builders Association, the Texas Association of Builders, the National Association of Home Builders, the Texas Residential Construction Commission and the Manor Chamber of Commerce. In addition, Voelker Custom Homes supports multiple non-profit organizations throughout the community and owners Stan Voelker and Ralph Reinhardt have held and currently hold many community leadership positions. Voelker Custom Homes is consistently a recipient of the Top Custom Homebuilders Award as featured in the Austin Business Journal, ranking 9th in 2010. Recently, the company received the prestigious MAX Silver Award for Best Product Design – $350,001- 500,000 – Custom. In 2010 Voelker Custom Homes was named the Chamber of Commerce Business of the Year. How do I get started with Voelker Custom Homes? 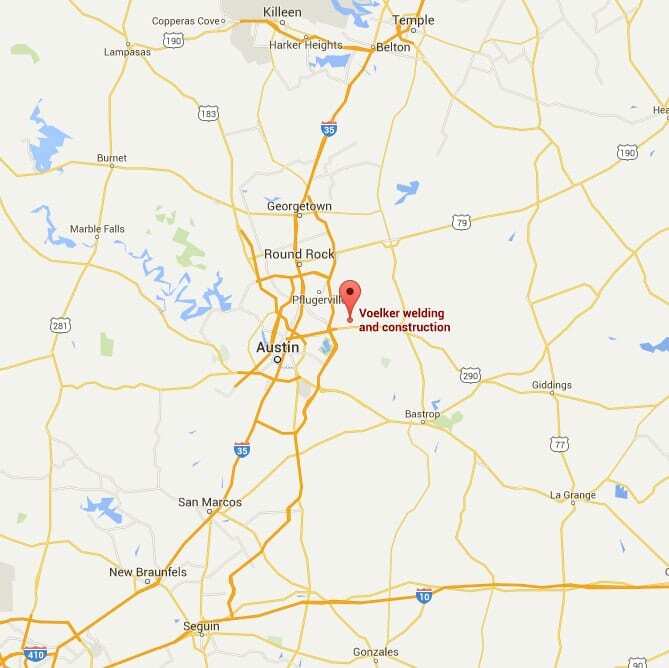 Voelker Custom Homes is conveniently located just east of Austin. Contact Stan Voelker or Ralph Reinhardt at 512-272-5458 for an appointment at the Voelker Custom Homes Design Center or other convenient location. To learn more about our process and capabilities, we encourage you to fill out this form to request a free consultation or quote. We look forward to hearing from you!